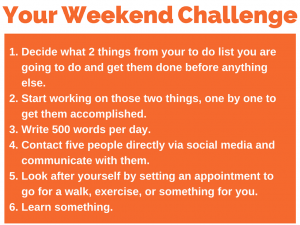 I thought for Friday, the weekend challenge, I thought I would tell you how I get through my day. Not in a so much of a sort of a to-do type thing, but some daily rituals. Five things that I do and I would suggest that you consider doing. You may tweak them a bit, but get yourselves some daily five-a-days. Your government may tell you to have five vegetables or fruits portions a day to keep yourself healthy. 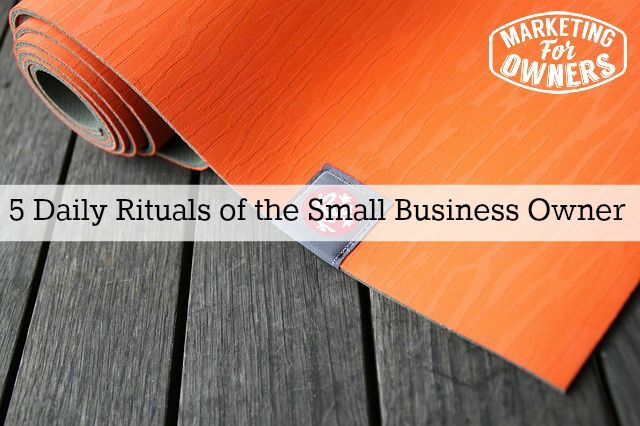 I would say for your businesses have five rituals that you do every day as well, doesn’t have to take that long. 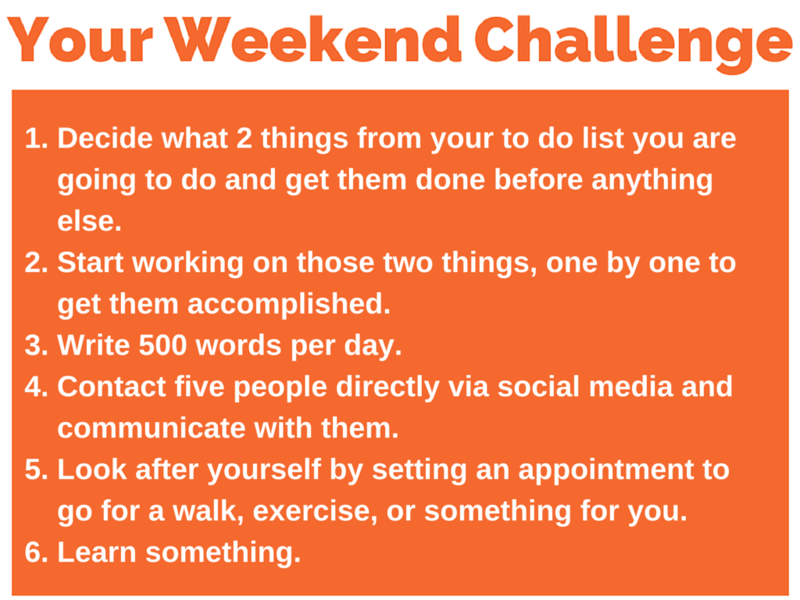 Get your pad, paper, and pencil and get ready to get your weekend challenge on! Number one–When you get up, decide what two things from your to-do list, you are going to complete today and make sure those will be completed before you do anything else. Number two— start working on those two things, one at a time by the way, before you answer a single email, before you look at your emails or before you return a phone call, or before you take a meeting. These are the things you’re going to do first. You will find you will have the rest of the day for all those things. People can wait. Number three–this one I know some of you would frown upon, but I want you to write five hundred words. It doesn’t matter what it is, write about anything, a blog post, a letter to a customer, a thank you letter. If you don’t like writing, write a series of bullet points outlining something for one of your assistants, or staff, or team members to write it up for you or for an outsourcer, but write five hundred words. Five hundred words by the way is not many. Once you get that down, you’re going to write way more than five hundred and you’re just going to reel them off and reply to an email. So don’t give me the “I can’t write five hundred words.” I’m like that. I thought that and I manage. Number four — contact five people directly via social media and communicate with them. Now that’s a tricky bit. So when I say contact, I mean they could be a customer, they could be someone in need. You could do a Twitter search for people like we do in fire safety, so I could search for the term “fire safety” on Twitter. Find out people who’ve got questions about fire safety and jump in and answer them, and then follow the person that asked. You never know, the next time they need fire safety gear, they make come back to me. But communicate with them. There’s Facebook, there’s Instagram, there’s something else. Don’t just say “great comment.” You can go on a blog post, read and reply, leave a comment with some helpful stuff. Get noticed. Make that communication something where you get noticed, but don’t ever expect anything back in return. Paying it forward, it will come. Again, five-a-day, that’s twenty-five a week, that’s a hundred a month, that’s twelve hundred a year. This is how you build a social media following, but with real people who want to talk to you, who have interest, and are engaged. Did you get it? Number five — we have look after ourselves. Set an appointment, put it in your diary. An appointment time for a walk, try and make it the same time every day so it becomes a habit. A walk, or some exercise. How about if you took half an hour for a walk, so that’s about two miles at four miles an hour which apparently is an average walking speed, it’s a bit fast, but they’re not as good an exercise. That’s one mile that way, fifteen minutes that way and fifteen minutes back again to where you started. You can measure in your car but no driving, you need to walk. That will keep you healthy, and that’s how you get to age fifty without dying, apparently, amongst other things. Number six. — I know I said five, but I’m giving you a bonus. Number six is not just always over deliver, beat people’s expectations. Over deliver, they’ll remember you for it. Number six, your bonus is “learn something.” Every single day, learn something by listening to a podcast, or reading a book, listening to a podcast is what you’re doing now, thank you number six done. Or reading a book, or watching a periscope scope, if you don’t know what that is, go back to episode 182, a couple of weeks ago on a Tuesday where I said what is Periscope and Meerkat? Get with a program people. When you read a book you can listen to them on audible like I do, when you’re driving to work, or driving to a shop, or walk around the supermarket or cooking, making hour breakfast, anything. That is six daily rituals. These are the kinds of things that I do every single day and these things make me better. They make me happier. They make my work easier. They make me healthier. They make me enjoy life, and they put a big cheesy grin on my face and that’s why I’m telling you, I think you ought to do the same. Find your own rituals, something similar, but just do them. It will work for you my friend. Trust me. That’s it, have a great weekend. Which one is a definite for you to work on?